What's the deal with carbamide peroxide teeth whitening? You may have read about some teeth whitening products containing hydrogen peroxide, and others containing carbamide peroxide. This can cause a lot of confusion! So how does teeth whitening work? Teeth get whiter when microscopic stain molecules deep inside the tooth enamel are broken down by "super oxide radicals". These radicals come from hydrogen peroxide. So why do some systems use carbamide peroxide? It has to do with how STABLE the whitening gel needs to be - how long it lasts sitting on the shelf! And the longer the shelf life, the slower it is to release hydrogen peroxide. So what do you want - a gel that has a decent shelf life but may be slow to whiten? OR a gel that has a short shelf life, getting faster whitening but ONLY if you get the gel while it's still fresh! Who knows how long it's been in the warehouse somewhere? Carbamide peroxide breaks down to release hydrogen peroxide (and urea). This is a SLOW reaction, which means it is much more stable than pure hydrogen peroxide, and will not deteriorate as much when left in storage. Think of carbamide peroxide as a way of "storing" hydrogen peroxide in a more stable form. Hydrogen peroxide on its own is quite UNstable, and breaks down quite rapidly. This is great when it is on your teeth, because it is doing its job. It is breaking down to release the superoxide radicals that do the whitening! But this rapid breakdown of hydrogen peroxide is not so good when it is still in the tube, sitting on a shelf waiting to be sold. After a period of time there will be no whitening power left in the gel! So storing the Hydrogen peroxide as Carbamide peroxide is a way of preserving the bleaching power of the gel. This is the basis for the SNOW system. Read more about it HERE. The main factor is temperature. 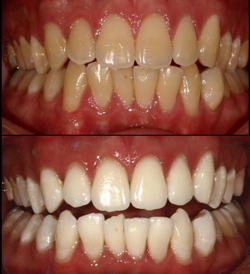 The teeth whitening gels are usually formulated so that they remain stable under 10 degrees Celcius. Once they get above 15 degrees Celsius, they start to react. Above that, at typical mouth temperatures, the reaction starts to run away, releasing the hydrogen peroxide! This is why you should always store your home whitening gel in the refrigerator until you want to use it. And also why top-of-the-line system KoR Whitening relies entirely on refrigeration from the point of manufacture all the way through to the dentist's office. Important point: The slow reaction time of carbamide peroxide means that it has to be left on the teeth for quite a while, usually around 2 hours, but sometimes less. This is OK for HOME teeth whitening, but MUCH TOO SLOW for the one-hour dental office whitening. You may also have noticed that the strength of whitening gels varies quite a bit. 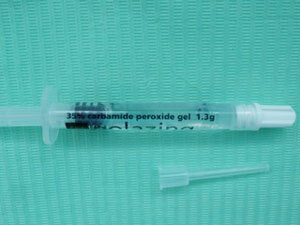 Carbamide peroxide gels always look stronger - 15%, 25% or even 30%. On the other hand, HYDROGEN peroxide gels are typically 10% for take-home systems. Click HERE to read about my top recommendation for home teeth whitening.